The emergence of oseltamivir (Tamiflu)-resistant 2009 H1N1 influenza virus in a Canadian family illustrates the basic concept that viral loads depend on the dose of antiviral drug. Neuraminidase inhibitors like Tamiflu and Relenza are used to treat severe illness caused by the 2009 pandemic influenza A (H1N1) virus. The antiviral drugs may also be used to prevent infection in high-risk persons, a use called postexposure prophylaxis. For Tamiflu, that means taking 75 mg a day, compared with the same dose twice a day for treating a confirmed infection. Unfortunately, using sub-optimal levels of an antiviral drug is a recipe for disaster. In this case, a boy with asthma developed confirmed H1N1 influenza and was given Tamiflu twice a day. Tamiflu was also prescribed once a day for all members of his household; this was presumably done to protect the boy’s father who has chronic obstructive pulmonary disease. Eight days after initiation of prophylaxis the father developed laboratory confirmed influenza. Sequence analysis revealed that the NA gene of the virus isolated from the boy and his father differed by just one amino acid change, H275Y, known to confer resistance to Tamiflu. This experience illustrates the important fact that antiviral therapy has the potential to promote or prevent the emergence of drug resistant viruses. When viral replication is blocked, no drug resistant mutants can emerge. If an antiviral drug is given after the viral population has expanded, or if the amount of drug is not sufficient to block viral replication, genomes that contain mutations will replicate. If the number of viral genomes is small, the infection may be cleared by the immune response. 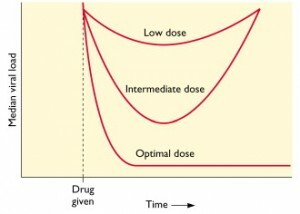 This concept is illustrated in the figure, in which median viral load is graphed versus time. Low doses of antiviral drug are not sufficient to block viral replication; there may be a transient drop in viral load but then replication resumes. At an intermediate dose of drug, viral load is initially reduced, but since replication is not completely blocked, resistant viruses emerge. At an optimal dose of drug all viral replication is blocked, viral loads drop dramatically, and no drug resistant mutants emerge. These observations support the need for limiting the indications for postexposure prophylaxis. It also seems reasonable to rapidly convert prophylactic (once daily) regimens to therapeutic (twice daily) regimens as soon as influenza-like symptoms develop in a patient receiving prophylactic treatment. Monitoring for the H275Y mutation during outbreaks of 2009 H1N1 virus is important in order to rapidly identify transmission events that could lead to large-scale dissemination of an oseltamivir-resistant 2009 H1N1 virus, similar to what occurred with recent H1N1 virus seasonal strains. Thanks for a very clear explanation of how antiviral resistant influenza strains can emerge. Wow is this a clear concise source of information!! Thank you so much for your effort.